Tara Giuliani was admired by all for her courage and determination to finish her education despite the onset of blindness resulting from diabetes. Tara had developed diabetes at the age of three and had always known that blindness was a danger, but thought it would occur gradually. However, during her first year at the University of Guelph, her sight began to deteriorate rapidly and after a sixth operation, just after her 21st birthday, she woke up blind. She was determined to go back to school and learned to write essays on tape, use a talking computer and read Braille. She also found the perfect guide dog to help her navigate the campus and community. 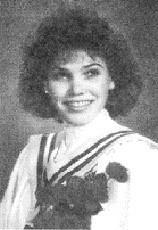 The daughter of Justine and Rick Giuliani, Tara was a graduate of Nelson High School in Burlington. When she died at 25 from diabetic complications, a tremendous outpouring of admiration and sympathy resulted in more than 150 donations to a fund established in her memory. The fund provides annual support to several organizations which were important to Tara as she coped with her illness – Ave Maria Place, Canine Vision Canada, Juvenile Diabetes Foundation, Joseph Brant Memorial Hospital and the University of Guelph where a bursary will be given to a student with disabilities.